The ideal vacation varies from person to person. It could be relaxing with no agenda, catching some rays with a good book in hand, pursuing your favorite sport or hobby, enjoying time with friends, or perhaps a bit of adventure. I combined a relaxing cruise with friends, catching some sun, and enjoying a good book (or two) with a bit of adventure and education on my latest journey. One of our destinations was Mexico’s Yucatan peninsula. The Yucatan and the eastern part of several neighboring countries are home to some amazing remnants of the Mayan civilization. 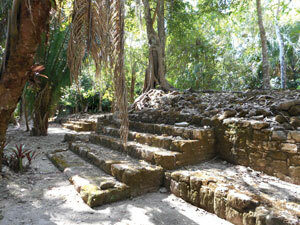 Exploring the ruins is an interesting side trip if you’re in Mexico, Belize, Honduras, or Guatemala. Plaza Las Vias, the steps lead from the large plaza to low-rise administrative and residential buildings. Here’s the educational part. Centered in the tropical lowlands of what is now Guatemala, the Mayan empire reached the peak of its power and influence around the sixth century A.D. The Maya excelled at agriculture, pottery, hieroglyph writing, calendar making, and mathematics. Many of their temples and palaces were built in a stepped pyramid shape and decorated with elaborate reliefs and inscriptions. The Maya also made significant advances in mathematics and astronomy, including the use of the zero and the development of a complex calendar system based on 365 days. Many of you may remember the furor in 2012 when a number of people believed that doomsday was upon us since the cycle of the Mayan calendar ended on Dec. 21, 2012 (the date of the winter solstice). Since we’re still here, obviously, the world didn’t end. On its website (www.nasa.gov), NASA explains that Dec. 21, 2012, was the end of a Mayan calendar cycle, and like calendars we have in our homes today, which end on Dec. 31, the cycle begins again. At its peak, the Mayan population may have reached 2 million, according to History channel (www.history.com). However, most of the sprawling stone cities of the Maya were abandoned, leaving behind impressive architecture and symbolic artwork. The steep stone steps lead to the Gran Basamento. Two temples on the upper lever form the ceremonial hub of Chacchoben. Scholars have debated what might have caused the dramatic decline of such a vibrant civilization, and some speculate that the Spanish conquest of the area inhabited by the Mayan people may be a factor. It’s also important to note that although the empire declined, the people didn’t vanish; Mayans still exist today. 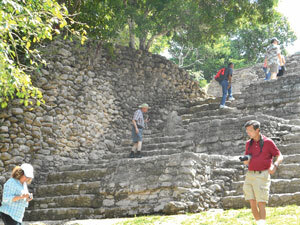 I chose this tour as my shore excursion in Costa Maya during the cruise. 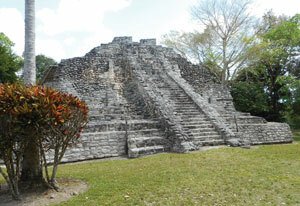 Chacchoben is about 56 miles west of Costa Maya. The ride to the ruins is interesting. Much of the port of Costa Maya and a good bit of the surrounding area sustained heavy damage during Hurricane Dean, a category 5 hurricane, in 2007, and some damage from Hurricane Ernesto in 2012. While the port and the neighboring community recovered relatively quickly, the environmental impact can still be seen. What had been large stands of mangroves throughout the area had been destroyed by the hurricanes, but they are beginning to come back, though small and not as densely populated. Las Vasijas, one of two temples in the Gran Basamento. The other temple is Temple 1, which has astronomical significance. 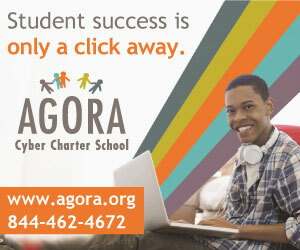 You may be wondering why this is important. My guide explained that the mangroves not only help absorb the impact from tropical storms, protecting the coastline, but they also serve as habitat for a number of fish. Like the terracotta warriors in China, evidence of the ruins was found by a farmer. 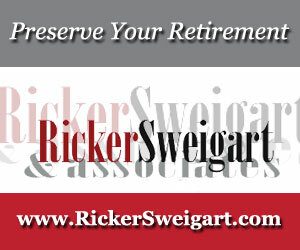 In this case, he was searching for a site for his farm in 1942. Thirty years later, the family hosted Dr. Peter Harrison, an archaeologist leading a project sponsored by Tulane University and the Royal Ontario Museum. He conducted the first exploration, made maps of the site, and reported the ruins to the Mexican government. Exploration was rebooted in 1994 as part of a project under the auspices of Mexico’s National Institute of Anthropology and History, and in October 2002 the restored complex was opened to the public. During the drive to the ruins, I also noticed that most of the area was relatively flat—there were few hills. And as we got closer, the vegetation became more lush and jungle-like. 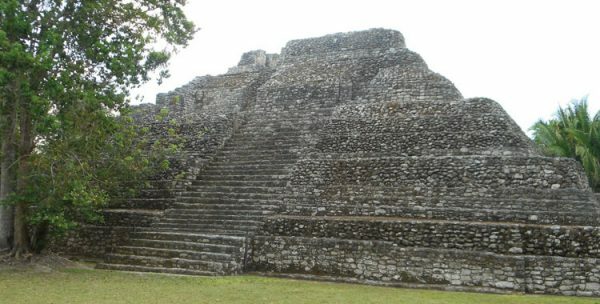 After Chacchoben was abandoned as a city, it continued to be used as a ceremonial site. Eventually that, too, ceased and it became like many of the Mayan sites—lost to the jungle. Chacchoben is an astounding place; it seems to rise out of the jungle. As we explored it and saw the surrounding jungle, some of which still envelops unexcavated parts, I imagine what it must have looked like before the excavation. Remember that most of the surrounding land is relatively flat, so the enshrouded temples must have looked like large mounds. Studies made during the excavations indicate that the earliest human settlement in the area dates to 1000 BC, and information suggests that while Chacchoben was abandoned and reoccupied several times, it was finally abandoned in 1000 AD. Walking through the site gave a glimpse into the lives of the people who lived there. Excavations of this and other sites have unearthed plazas, palaces, temples, and pyramids. There were also courts for playing ball games. We could only climb a few steps on the temples to take pictures, but we were permitted to climb the stairs at the Gran Basamento to view two ceremonial temples (pyramids). The climb up these stairs can be an adventure in itself, as one may expect of a restored ruin—the stairs themselves are a bit uneven and there are no handrails. I felt an amazing sense of history as I thought about all the people who had climbed the stairs before me. A large, flat rock with rounded edges and a small hole in its side is on the left side of the staircase. I channeled an Indiana Jones movie when our guide explained that on the day of the winter solstice, the shortest day of the year, you can see the light of the setting sun shining directly through that hole in the rock. And that’s not the only amazing marvel. On the day of the summer solstice, the longest day of the year, for about five minutes you can see the light shining through the opening at the top of this 60-foot-tall pyramid on the high plaza to the right of the stairs. From the plaza, I looked out over the jungle and could see a mound rising above the treetops. Our guide indicated that most likely the mound covers an unexcavated pyramid similar to the one behind us. Pretty cool stuff!